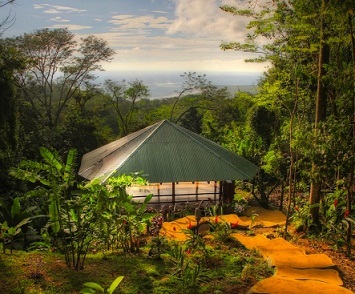 Since the project commenced back in 2006, Selva Armonia Retreat Center has expanded its reputation as the ideal destination for yoga retreats in Costa Rica. Nestled in the mountains of Uvita, Costa Rica, Selva Armonia Retreat Center is a secluded space that offers a blissful experienced amidst the exotics of mother nature. 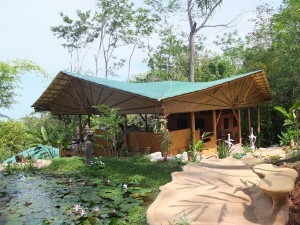 Selva Armonia’s “Eco-Retreat Center & Lodge” offers plentiful space to host all types of retreats, as well as simply relax and connect with guests. More than just a space for yoga retreats, Selva Armonia hosts activities and workshops spanning from kayaking and scuba diving to hiking and ziplining. Immersed in a gorgeous jungle landscape overlooking the Pacific Ocean is a beautifully constructed bamboo yoga deck. Selva Armonia’s open-air “floating” yoga deck is measured to be 800 sq feet and offers the optimal capstone for a yoga retreat in Cost Rica. The deck is primarily made available for yoga retreats as well as for daily use by guests and members of the community. In addition to yoga retreats, Selva Armonia supports a wide range thrilling endeavors that cater to all interests. Guests can explore the riches of Costa Rica in many different ways. Often times what makes for an amazing yoga retreat is the adventure to be had outside of one’s yoga practice. Guests of Selva Armonia will never be short of exciting things to do in this tropical paradise. All of these activities, and more, are conveniently located just a few moments away from the Selva Armonia Retreat Center. Just a short drive from Selva is the National Marine Park of Costa Ballena, which boasts magnificent scenery and a number of other adventures. With all of this action embedded in the amazing jungles and stunning beaches of Costa Rica, you can experience an environment far beyond what you’d ever imagine. The landscape of Selva Armonia gives way to a splendor of natural treasures. Those involved in a yoga retreat may seek serenity away from their practice by relaxing near the one of the lotus ponds, botanical gardens, or perhaps taking a dip in the natural swimming hole. The area is well-known for its continuously expanding botanical and organic gardens. These unique garden grounds host over 120 varieties of plants, including medicinal herbs, vegetables, exotic fruits, and more. As a sustainable retreat center, Selva continues to cultivate and preserve these plants, while preparing and serving its harvest for guests. Vegan and vegetarian-friendly meals are prepared by a gourmet chef and served on a community dining table at the Eco-Retreat Center & Lodge. The lodge comfortably accommodates 20 individuals in spacious rooms and shared bathrooms. Just a short walk from the lodge tucked into the jungle are two private bungalows that offer more intimate living quarters. Here guests can enjoy a private balcony overlooking the jungle, along with shared private bathrooms and shower facilities. Spread throughout Selva’s property is an array of organic gardens all rooted to sustainable growing practices. This effort is commonly known as “permaculture,” which reflects a sustainable form of agriculture that requires minimal maintenance and outside resources to thrive. Selva was also established based upon sustainable building practices, as less damaging construction alternatives were used to erect many of the structures on the property. 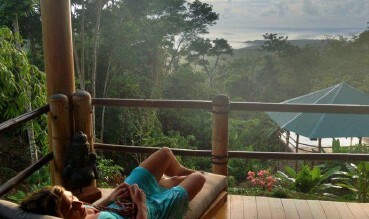 Why Selva for Your Costa Rica Yoga Retreat? Selva Armonia is a highly sought destination for yoga retreats in Costa Rica. The rich environment and breathtaking scenery coupled with countless activities and adventures makes Selva a heavenly location. Beyond yoga, Selva offers something for any style vacationer. This article was written by Tyler Tafelsky of Dharma & Grace Yoga. Learn more about how to join Dharma & Grace Yoga on their next yoga retreat in Cost Rica.